Borough, SE1, might largely be known for hosting the capital’s premier food market, but there are other ways to spend an afternoon if you’re in the area. Of course, if you’ve yet to sample the fresh oysters or slabs of locally-produced cheeses, then put a visit to Borough Market in the diary, but in this article, we’re going to let you know about other ways to spend the day...when in Borough. As you may imagine, the history of Clink Prison is, like the Tower of London’s, a decidedly grim and gruesome one, but fascinating nonetheless. Dating back more than 600 years, the walls have many stories to tell. Not only will you learn about the history of Clink Prison and the lives and identities of notable prisoners, you’ll also discover the social and political events which affected the prison and the way in which it operated. It is a family-friendly venue but expect to be ever so slightly spooked. A church has been on the site for centuries, but in 1905, St Saviour’s Church became Southwark Cathedral. A heritage site, Southwark Cathedral is a fine building to explore. It continues to play an important role in the local community, and serves as a place of prayer, teaching, and as a venue for events and projects. Only a stone’s throw from Southwark Cathedral is the Golden Hinde. This magnificent vessel is a reconstruction of the galleon captained by Sir Francis Drake when he circumnavigated the globe between the years of 1577 and 1580. Launched in 1973, this replica sits on the banks of the River Thames at St Mary Overie Dock. The Golden Hinde has been in its current position since the mid-1990s but has sailed more than 140,000 miles around the globe. It is a feat of nautical engineering, and well worth a visit. The Cloak and Dagger Tour starts at The George Inn on Borough High Street, reputedly the oldest pub in London. Attendees are taken on an enlightening, immersive tour and given a history lesson by a ‘mysterious guide’. Be prepared for some rather grisly details about murder and mayhem in Southwark, but if you’re interested in history and the tales of ordinary people in old London, you’ll find this performance tour riveting. For those who want to catch a breath and a restorative sit down while in the area, you can do so in the quiet confines of St Dunstan-in-the-East. Originally built as The Church of St Dunstan, it was badly damaged during the Blitz and what stands today is the remains of the old church. In 1967, the City of London opened the ruins as a public garden, and they remain open to this day. Come rain or shine, it’s a pleasure to visit St Dunstan-in-the-East, where you can park down on a bench and take in the atmosphere of this garden and truly stunning church ruins. You don’t need to be a medical student with plans for a career as a surgeon to find this place fascinating. Known formally as the Old Operating Theatre Museum and Herb Garret, the venue is described as ‘Europe’s oldest surviving operating theatre’, where surgeries took place before the aid of anesthetics and antiseptics. 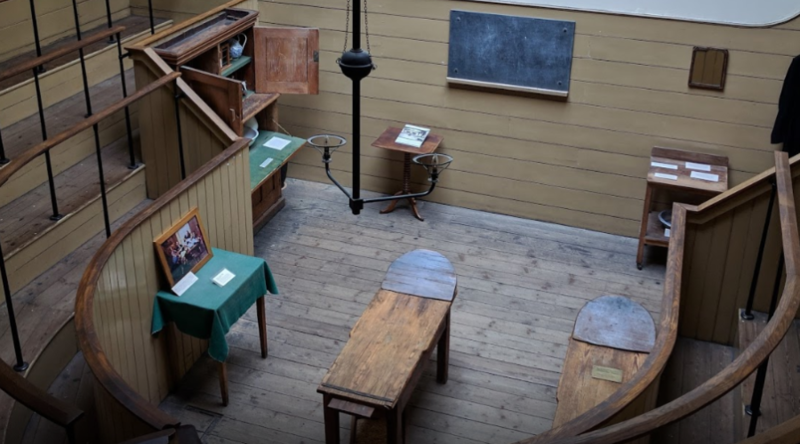 Situated in the roof of St Thomas’s Church, part of the old St Thomas' Hospital, the Old Operating Theatre, which dates from 1822, gives visitors insight into what surgery was like a hundred or more years ago. You can also see the Herb Garret, where the herbs for medicine was stored, and the wider museum. If you’re near London Bridge, we do recommend you visit. There’s so much more to see and do in Borough. For more information about what the area has to offer, see our Guide to Borough. Alternatively, for information about letting or renting property in Borough, get in touch.